You can read and download the newsletter here. If you would like a hard copy, please email us. Have a wonderful holiday season from all of us at the Children’s Scholarship Fund! CSF’s 2012-13 annual report is hot off the presses today and available for downloading at: http://bit.ly/FY1213AR. Take a moment to read about some of the thousands of families nationwide who are using scholarships provided by CSF or CSF partner programs and find out how parental choice in education is making a difference in the lives of more and more families. The latest CSF newsletter has just arrived from the printer. 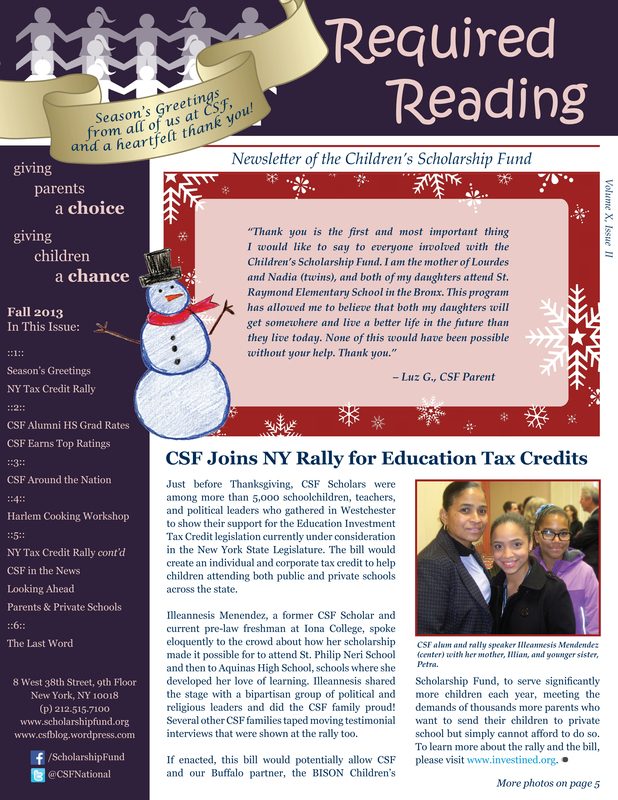 CSF’s Fall Newsletter Is Here! Read all about it! 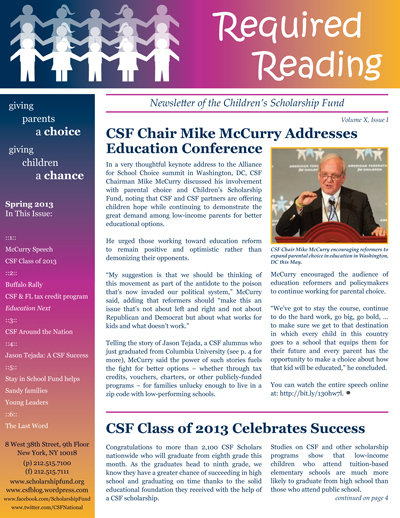 The latest CSF newsletter is hot off the presses. You can read and download the newsletter here. 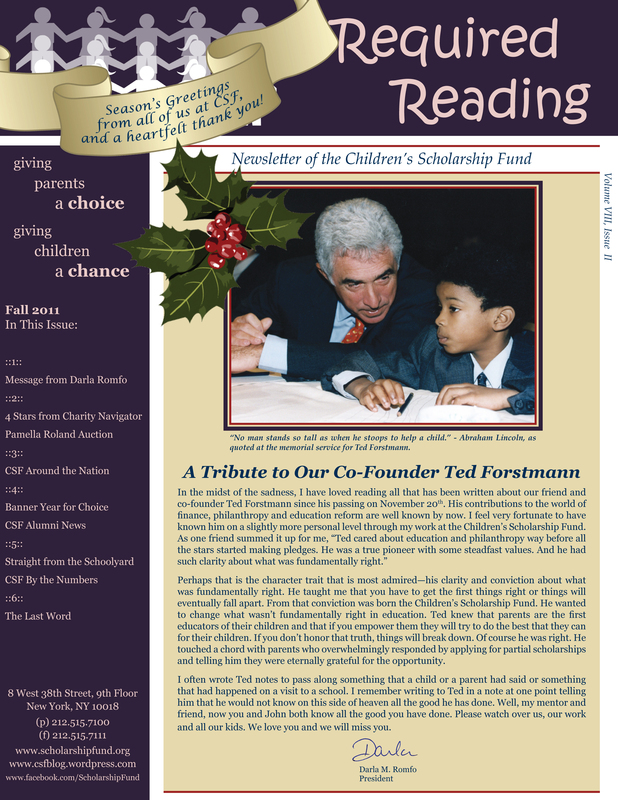 Season’s Greetings and Happy Reading from Children’s Scholarship Fund! The theme of Children’s Scholarship Fund’s 2011-12 annual report is simple: Dreams + Opportunities = Results. At the Children’s Scholarship Fund, we’ve seen that the powerful combination of dreams and opportunities leads to results that are both measurable and heartwarming. In this year’s annual report, you can read about the positive impact CSF scholarships are having on the lives of several CSF Scholars and their families and learn why CSF remains a sound investment. A special thank you goes out to all of CSF’s friends and supporters. As you read the report, please remember your investment leads to life-changing results. Download your copy of the annual report here. A feature on St. George’s Independent School in Memphis. The latest CSF annual report is hot off the presses and available to download! The report covers everything from CSF’s generous contributors and our partner programs to financial details for the Fiscal Year 2010 and stories about the impact CSF scholarships have had on our scholars and their families. You can download your copy here.